What This Offering Will Do For You - Locate, analyze & fund local equipment leases and make sizable fees doing this. All info and forms are included and this is a business that can be run from home. Equipment leasing is a fast fun business needing no licensing or anything. This business is wide open. Why do people want to lease equipment instead of buy? Simple, their monthly payment is lower, they need less cash down and they can write off the WHOLE payment as an expense for income tax purposes! There is a simple form that the leasing party completes which is FAR LESS extensive than a loan application and in a matter of days, they have their lease money to enjoy the equipment they need! Another big reason people lease instead of buy are the tax ramifications. Instead of being able to write off a portion of your monthly payment and depreciate the purchased asset over several years; with leasing, you write off the whole monthly payment and there is no need to depreciate the asset, which simplifies tax time and SAVES THEM TAX DOLLARS! Who wouldn’t want a lower Monthly Payment and save more on their income taxes? Here is how the business works. A potential leasing client contacts you about the prospects of leasing their next purchase instead of buying it. You send them a very short lease form and when you get it back you circulate it to various leasing companies to get a quote. You may mark this quote up a bit and get your buyers acceptance. Let’s say the leasing company quoted you an APR of 8% on your client’s lease of $10,000. You sell a 9.5% APR to your client and make money without charging any up front points on the lease! You will make $300.00 to $400.00 on this transaction and it will fund in a matter of days! The difference in payment between the 8% and the 9.5% you quoted is only $7.26 per month, and who is going to quibble about 7 dollars a month? …. Right again, nobody! This is a great business! Most states do not require any licensing. You play with the payment and interest rate a little and you will make some great money! If you had raised the APR on the lease 2% the payment would have increased the monthly payment about $9.71 a month and you would have made about $456.84. Most lessees will not quibble on this rate and you made about $500.00 for a few days work! 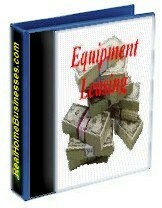 Some Equipment Leasing Brokers charge a front finder’s fee of say $100.00 to find the best lease available. You add this $100.00 to your other fee of $500.00 and now you have made $600.00 for about 3 days of work! That isn’t too bad I’d say! In Short: This program will show you how to find clients interested in Leasing Equipment, what info to gather from them and where to present this information to get them funded. You could be in this exciting business tomorrow! This is such a great Business !!! and so Simple to Operate !!! We offer these services to our clients on www.My-Biz-Doc.com and we could work with you if you desire..
You could be in this business tomorrow. In Short: This program will show you how to get clients, gather the necessary information and present it to funders. You could be in this exciting business tomorrow!